Now, if you do a search for web design, web development, or most digital agency like queries, with or without a local qualifier (i.e. 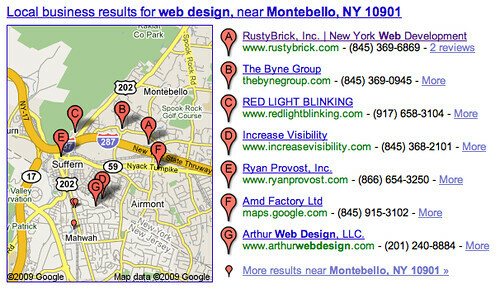 web design new york), Google won't show the local 7 pack. Mike Blumenthal covered this well, but it needs more attention. There are two large threads about this at the Google Maps Help thread. In one of those thread, Googler, Linda said on November 11th, "Thanks for your reports. I will look into this issue and get back to you." This looks like it's closely related to the issue going on at the thread I've linked below. We realize there's something going on here, and we initially pushed out a fix a while back. There was a little hiccup with the fix, which is probably why the results in Fresno may have gone back up and then back down as addoctane mentioned above. The team is working on this issue. Stay tuned to the thread below where I will post an update as soon as I hear one. Thank you all for your persistence! Back in late October, there was a bug we covered where Google would show a single one box instead of 7 business results. Google fixed this bug in early November, which seemed to trigger a new bug with [web] related local queries. Google seems to be working on a fix for this bug as well and hopefully it will be resolved shortly. Previous story: Buy a Banned Domain? Should You Ask Google for Forgiveness?